In 2009, as a NOLA Fellow with non-profit organization Broad Community Connections (BCC), I partnered with fellow urban planner Jackie Dadakis from MIT and two architects from Washington University in St. Louis, Philip Burkhardt and Brendan Wittstruck, to create a redevelopment plan for an abandoned grocery retail site on Broad Street in New Orleans for the Chase Community Development Competition. Broad Street is a historic commercial corridor in the City, though even before Hurricane Katrina in 2005, which flooded the corridor with up to four feet of water, small business ownership and investor interest was in decline. Although a number of diverse small businesses have since returned or opened, the commercial district of Broad Street continues to suffer from vacant and abandoned properties and lacks the vitality and retail investment of other main streets in the City. 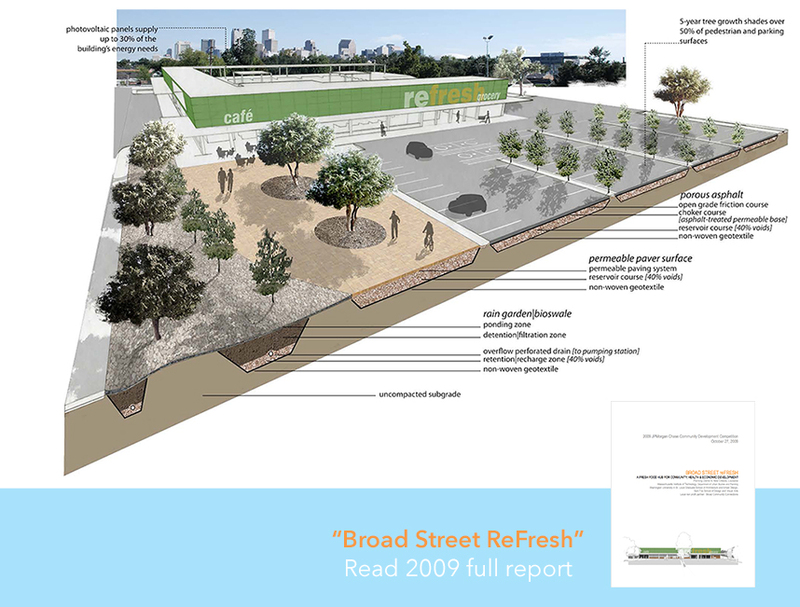 Our proposal sought to reinstitute Broad Street as a destination rather than a thoroughfare. Guided by community-driven neighborhood and City plans, this proposal aimed to reactivate the former Robert’s Fresh Market at 300 North Broad Street, an important landmark designed by the local architect Albert Ledner. Located at the corner of Broad and Bienville Streets, the store ceased operation after Katrina and has been sitting vacant for several years. Our team envisioned transforming the Robert’s site into a retail anchor on Broad Street and a generative model of economic development along the corridor. We proposed redeveloping the site into a tripartite fresh food hub consisting of a new grocery store, a processing center for the healthy school lunch distributor Revolution Foods and a rooftop urban farm and community-supported agriculture program. Our redevelopment plan won second place at the Chase Community Development Competition, awarding non-profit BCC $15,000 to implement the vision. In February 2014, a Whole Foods opened its doors at 300 North Broad Street.